There are a myriad of benefits to engaging in active play with a child, from fostering creativity to helping build physical and cognitive strength. Playgrounds are often the setting of active play between parents and children, but care should be taken to avoid injuries. Playground injuries are more common and more serious than you might think. Each year, more than 200,000 children ages 14 and younger are treated in hospital emergency departments for playground-related injuries, including broken bones, internal injuries, and concussions. While bumps, bruises, and scraped knees are often par for the course during childhood, slide-derived broken legs may be avoided simply by electing not to ride down a slide with a child on your lap. A new study by the American Academy of Pediatrics finds that children using slides are far more likely to injure their lower leg or shinbone when on a parent’s lap. 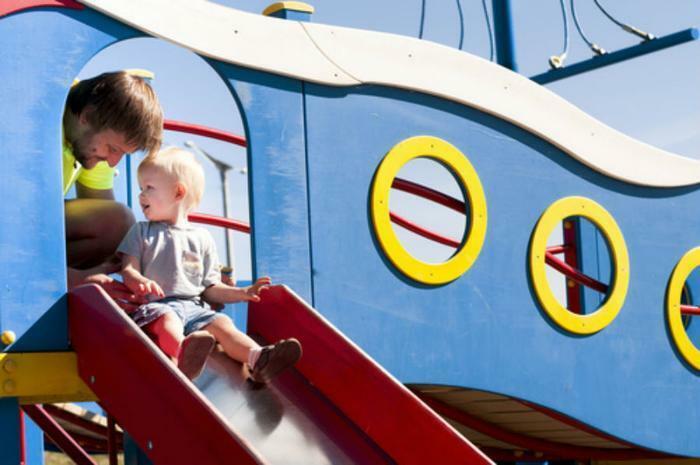 Kids who ride down a slide alone are unlikely to suffer a broken bone if their foot catches the edge or bottom of the equipment and is twisted backwards. But on a parent’s lap, they will whiz down the slide much faster because of the added weight of the adult, making bone fractures more likely if their foot gets caught. The study, which looked at injuries in more than 350,000 children under age six on playground slides between 2002 and 2015, found that the majority of the injuries for toddlers and infants on slides are fractures. “Many parents and caregivers go down a slide with a young child on their lap without giving it a second thought,” said the lead author of the new research, Dr. Charles Jennissen, from the University of Iowa. In light of the study’s findings, the researchers recommend that adults and teens not go down a slide with a young child on their lap. If caregivers do choose to do so, extreme caution must be used to prevent the child’s foot from catching on the slide’s surfaces.